Someone has finally had the courage to speak out, and ask the question “Why can’t staff eat breakfast at home?” Smartcompany [^]. I fall firmly into the “I’m not going anywhere until I’ve eaten camp” of breakfast eaters. The thought of driving to work and then eating breakfast is completely foreign to me. I don’t even know that I would make it to work, I’d probably pass out from hunger! How can this tiny fringe benefit makes a difference? How does being late to work, and then wasting 10-15 minutes eating breakfast make sense? 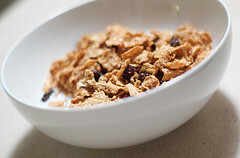 I can’t say that I’m completely against the eating breakfast at work thing, but please people show some discretion, 11 o’clock is probably a bit on the late side for brekkie, and do not even think about putting the last of the milk on your cereal – it needs to go in my coffee!